Using Open Source Software (OSS) in undergraduate teaching in universities is now commonplace. Students use OSS applications and systems in their courses on programming, operating systems, DBMS, web development to name but a few. Studying OSS projects from both a product and a process view also forms part of the software engineering curriculum at various universities. Many students have taken part in OSS projects as well as developers. At the University of Lincoln, under the Undergraduate Research Opportunities Scheme (UROS), undergraduate student researchers have the chance to work over the summer embedded within an existing research centre on a UROS project. 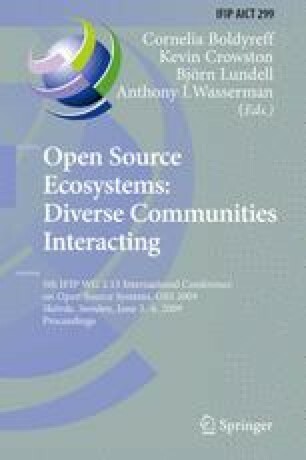 Here two such projects within the Centre for Research in Open Source Software (CROSS) are described: Collaborative Development for the XO Laptop (CODEX) and Software Modularity in Open Source Software (SoMOSS). The CODEX project focused on creating resources to support students undertaking software application development for the XO laptop, and the SoMOSS project focused on architectural studies of OSS instant messaging software. Both projects achieved successful research outcomes; more importantly, both student researchers benefited directly from the encouragement and concrete assistance that they received through interaction with the wider OSS research community. Both projects are ongoing and present further research opportunities for students.